I say, this is like something by that novelist chap, Mister Wells. Now Wells impact on Doctor Who is rather obvious. One of Wells most famous works “The Time Machine” helped inspire the very concept of the series itself. However Wells influence on the series runs a little deeper than the fact that Doctor Who simply revolves around time travel, a science fiction trope that Wells perfected and defined with his classic novel. Many stories and prominent characters and concepts in Doctor Who have been lifted from Wells novels and the franchise has even paid tribute to him a number of times. Doctor Who is not unique in taking inspiration from Wells. 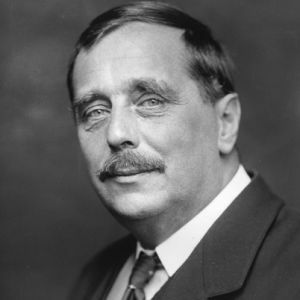 Wells truly is one of the founding fathers of science fiction and his influence can be seen in many prominent genre stories across many different mediums. However as Doctor Who is probably the most prominent piece of time travel fiction other than Wells iconic novel itself, then I think Doctor Who will perhaps always be more associated with Wells than other works. The whole concept of Doctor Who about an eccentric scientist travelling though time obviously owes a lot to Wells classic novel “The Time Machine.” However stories in particular which draw on Wells work include the first two Dalek stories “The Daleks” and “The Dalek Invasion of Earth”. Terry Nation the author of both stories cited Wells as one of his favourite authors. “The Daleks” bares many similarities to “The Time Machine”. Both stories are set in the future. 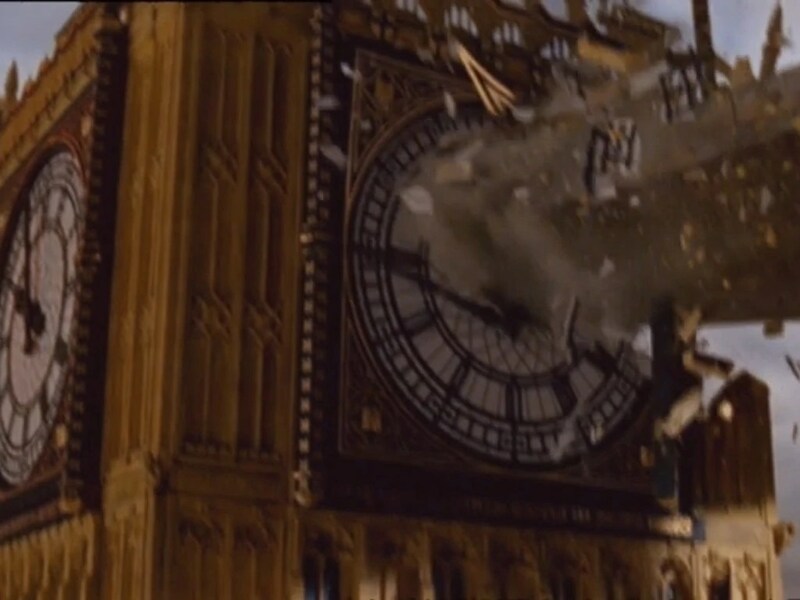 Though its not made clear in the narrative that the Daleks takes place in the future, Nation intended it to be as revealed in the next Dalek story, “The Dalek Invasion of Earth”. Both stories also see a society splinter into two factions. One peaceful, but ultimately useless, beautiful humanoids, the other frail, but technologically and intellectually superior creatures. The Daleks are essentially the Morlocks (Morlocks, Darlecks, Daleks) whilst the Thals are the Eloi and the Doctor and friends are substitutes for Wells time traveller who tries to convince the peaceful, but placid humanoids to stand up to their oppressors. Of course whilst there are similarities between both stories, it would be wrong to say the Daleks is derivative of “The Time Machine” The Daleks used the same basic idea of two societies, one peaceful but stagnated being persecuted by the other more advanced but weaker physically and added the race hatred aspect to it. The story is able to make its Morlocks, The Daleks serve as a brilliant metaphor not just for race hatred and the Nazi regime in particular, but man’s inhumanity to man in general, as well as man’s destructive effect on the environment and the threat and consequences of nuclear power. “The Daleks” takes on a whole new life to “The Time Machine” and serves as a powerful story in its own right. The comparisons between the Daleks and the Morlocks and the Thals and the Eloi get even stronger when you take Nations short story “We Are The Daleks” into account. This story which Nation wrote for the Radio Times marked the first time Nation attempted to give an actual origin for the Daleks. It revealed that the Daleks were in fact human beings from a point in the future and the humans who would become the Dalek’s evolution was accelerated, which turned them into the Daleks on the planet Ameron by a race known as the Halldon. As the Daleks were once human beings so logically therefore were the Thals, as Ameron it is implied would one day become known as Skaro with the Thals being the humans whose evolution was not accelerated. The Thals and the Daleks therefore much like both the Eloi and the Morlocks were actually our descendants too. “The Dalek Invasion of Earth” meanwhile draws on “The War of the Worlds” The Daleks are comparable to Wells other most famous creations The Martian Invaders. 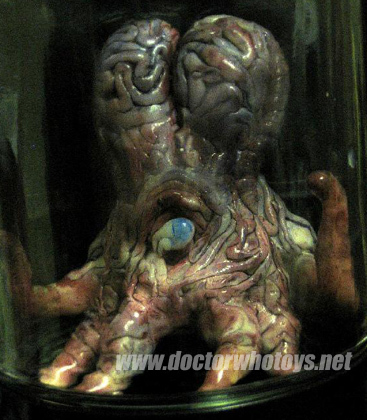 The Martians are octopus like creatures who house themselves in near indestructable robotic casings exactly like the Daleks. Like the Daleks they also come from a dead planet. Both the Daleks and the Martians manage to conquer the earth too and both stories show us the earth under these cruel invaders rule. The film version of “The Daleks Invasion of Earth” titled “Daleks Invasion Earth 2150AD” meanwhile sees the Daleks just like the Martians get destroyed by a natural force on the earth, a force that does not affect human beings. In the Martians case it is bacteria that poisons them whilst in the Daleks it is the magnetic power of the earths core that pulls them into it and destroys them. Both cases show the planet itself destroying the invaders rather than humanity. Whilst they may have taken on their own life ultimately, in many ways the Daleks in their earliest appearances can really be seen as an amalgam of Wells two most famous creations. The Morlocks and the Martians. One thing in particular that “The Dalek Invasion of Earth” and many other Doctor Who invasion earth stories do, that comes from H.G. 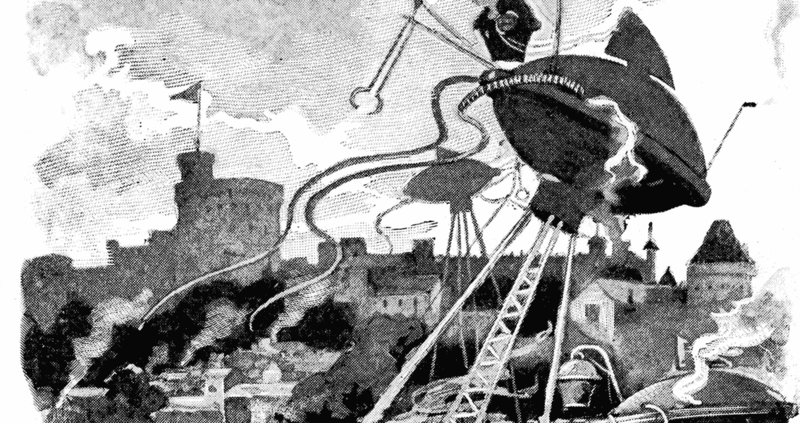 Wells “War of the Worlds” is show the alien oppressors marching in front of familiar earth landmarks to demonstrate how the alien menace has triumphed over us as it has now claimed an iconic symbol of humanity for its own. The chances of anything coming from Mars, Skaro, Planet 14 and Raxacoricofallapatorius are a million to one, but still they come. Whilst the Daleks are essentially the Martians and the Morlocks combined, Davros can also be seen as something of a Doctor Moreau figure. Whilst Davros obviously draws on a number of sources both literary and real life, there are aspects of Moreau in Davros, and Davros’s failed experiments in Genesis are comparable to the monsters Moreau creates too. Another story to draw on Wells influence specifically is the three part Season 3 finale. “Utopia, The Sound of Drums and The Last of the Time Lords”. The future the Tenth Doctor, Martha Jones and Captain Jack visit is very like the future in the Time Machine. Here humanity has split into two sides, one degenerate and one peaceful like the Morloks and the Eloi. However in quite a good twist the degenerate side are the more primitive. The Toclafane meanwhile much like the Daleks could also be seen as an amalgam of the Martians and the Morlocks. Like the Morlocks they are our degenerate deescendants, but like the Martians they are also withered creatures who are housed in mechanical shells and the Toclafane’s subject of humanity is comparable to the Martians. Wells influence runs right throughout Doctor Who, but definitely the strongest examples are on some of the most prominent icons and characters of the series such as The Daleks, The TARDIS and even the main character the Doctor himself. 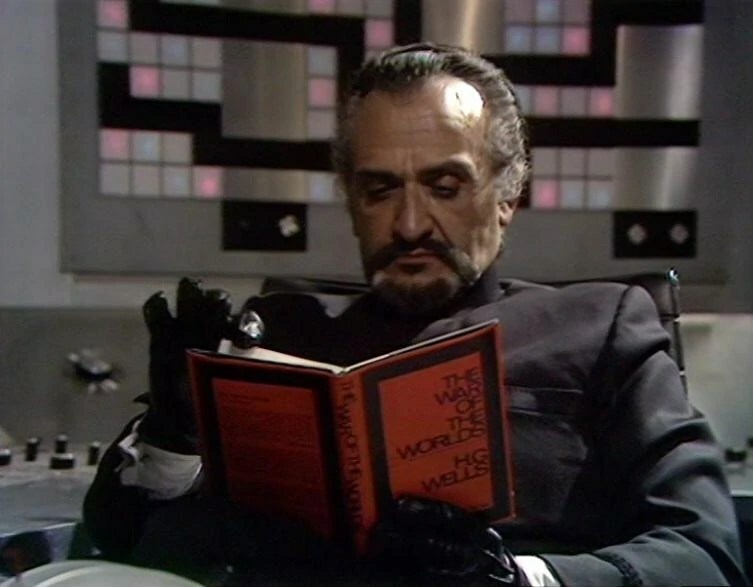 In “Frontier in Space” The Master is shown to be reading Wells novel “War of the Worlds”. The plot of this adventure sees the Master try and provoke a war between two planets Earth and Draconia. In “Pyramids of Mars” Lawrence Scarman comments that the Doctors TARDIS is like something from H.G. Wells. In the story “Timelash” H.G. Wells actually appears as a character.played by David Chandler. This story reveals that his stories were inspired by an adventure with the Doctor where he travels to an alien world, witnesses a battle between two planets, the Doctor seemingly turning himself invisible, encounters alien monsters called Morlocks and helps the Doctor defeat a scientist called the Borad who has been performing experiments, one of which turned him into a freakish monster. Sadly “Timelash” was panned, and in all honesty it is quite frankly awful. However in some ways I see Timelash as ironically being quite influential. Its basic formula of having the Doctor encounter a figure from history who helps him defeat a monster, with his adventure with the Doctor going on to inspire his own famous work.. Yes ironically “The Unquiet Dead”, “The Shakespear Code”, “The Unicorn and the Wasp” and “Vincent and the Doctor” are all essentially the same idea as “Timelash”. Maybe “Timelash” isn’t so bad after all? The Tenth Doctor encounters H.G. Wells in a comic strip “The Time Machination” where he helps him battle the renegade time traveller Jonathan Smith and Torchwood. This story also sees Wells encounter the 4th Doctor and Leela at the end of the story too, though he does not make himself known to them. The Second Doctor encounters Wells in the Big Finish Audio The Piltdown Men. The Doctor meets that guy that ripped off all of his adventures. Feeling pretty stupid right now. I hadn’t made the Martian connection to the Daleks, although it was right in front of me. I have to say, you’re convincing me to watch the show more critically. Not that I always park my brain while I’m watching the Doctor, but I tend to look for different things than what you’ve shared. Placing Doctor Who in its historical/literary context is not usually what I focus on. Perhaps I could use a re-watch. I knew the Wells-ian roots of the Daleks, I never thought about the connection with “Utopia” though. Nice catch. Thanks. Really Glad you’ve found my blog. Keep posting.